Winnipeg won three times on the top-seeded Predators’ home ice, including Game 7 last week. ”They came out flying again with a lot of speed,” Fleury said. 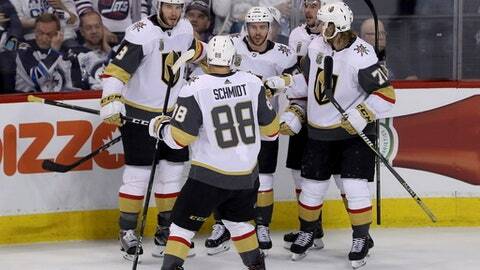 Winnipeg’s Mark Scheifele, who has postseason-high 12 goals , got the puck past Fleury in the opening moments of the game and Vegas defenseman Nate Schmidt cleared it from the crease . ”There was about 57 minutes of that game that was pretty good for us,” Jets captain Blake Wheeler said. ”Three minutes of it got away from us. The Jets closed the scoreless second period and started the third on the power play and still couldn’t get the puck past Fleury. That whipped the white-clad fans into a frenzy – triggering jeers of ”Fleu-ry! Fleu-ry!” – and were quickly quieted by another Marchessault backhander that beat Hellebuyck. The Jets pulled their goaltender to add another skater over the last couple minutes of the game, but Fleury didn’t let the puck get past him again.